Where to Play Spiñata Grande for Real Money? 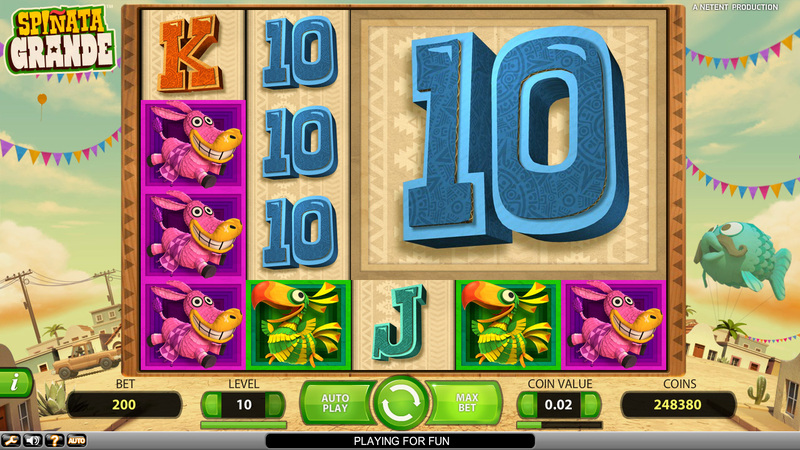 The theme of this slot is piñatas, and the fun that you can have when smashing them open and gathering the goodies inside. It doesn’t sound like it should be the most exciting theme, however it actually delivers loads of fun to all players, and much of this has to do with the colorful reels and beautiful backdrop. It’s easy to forget how much the way in which a slot looks can affect overall enjoyment, however this slot proves this point without any doubt. As you’ll see further down the page though, it’s not just bright colors that make this slot exciting though! When a slot simply uses standard symbols on their reels, it usually ends with them being labelled as lazy, as they haven’t been bothered to create something original and exciting. This isn’t the case at Spiñata Grande though, as the 10 through to A symbols actually work really well. What’s more, they’ve been created to perfectly complement the site’s colorful and exciting theme, and also come with some more original symbols. So, overall the theme of this slot is a great one, and one that should really appeal to slot players of all different types. Why not have a few spins right now? 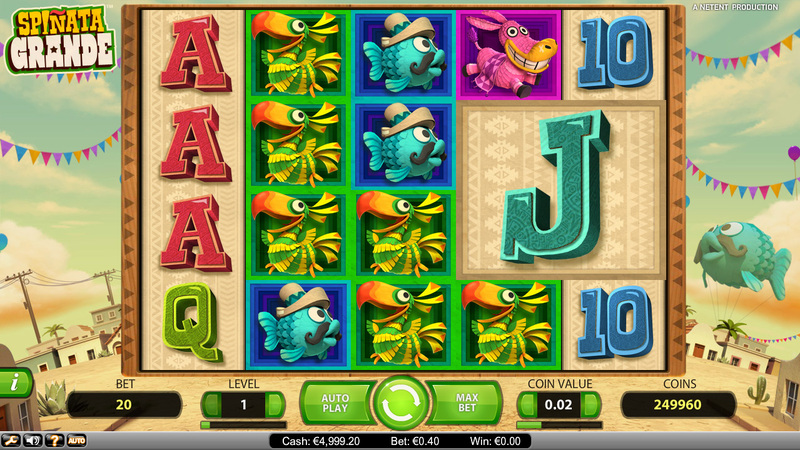 How to Play Spiñata Grande Casino Game? 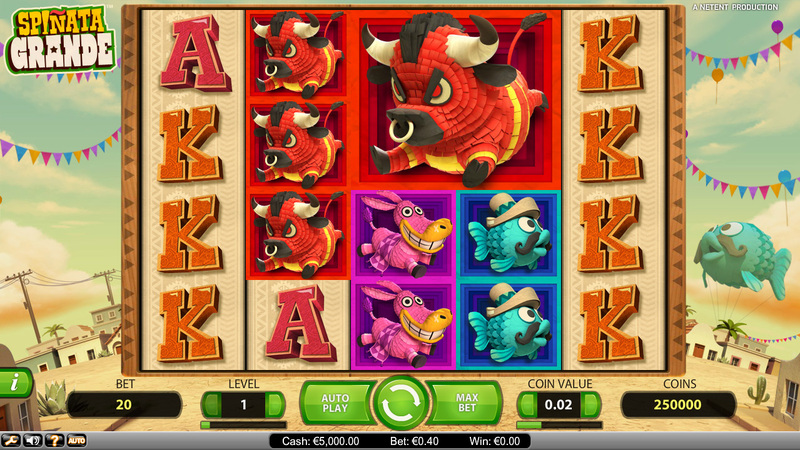 The gameplay at Spiñata Grande is pretty much as you’d expect from a slot made by NetEnt, in that it is incredibly easy for anyone to play. All of the paylines are fixed, so there’s no need to choose how many you want to play, however you are able to change the amount you bet, which can range from 0.20 coins all the way through to a massive 200 coins. This makes this slot perfect for smaller stakes players and high-rollers alike. Once you have decided on how much to bet, it’s simply a case of getting the reels spinning and waiting to see how much you manage to win. Once the reels stop, you could find yourself winning a massive prize, with the jackpot at this site coming in at an impressive 120,000 coins. What’s more, these bigger wins often come in groups, so if you’ve got one, you could well find other large wins heading your way soon. Of course, most wins are smaller ones though, and keep you afloat until a larger one comes along. 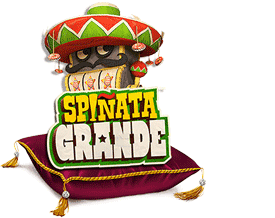 So, if it’s a simple slot with the potential for some big wins you’re looking for, Spiñata Grande could well be a great choice for you! There’s one feature that you’ll see at this slot more than any other, and it is the fact that colossal symbols often appear on the reels. These can be as large as 3x3 and help massively when it comes to creating winning combinations. When one of these symbols lands on the reels, only part of it has to be in a winning combination for you to get paid out. It’s also often the case that a giant symbol will create multiple winning combinations in the same spin, which is great news for those who see it spin into view. Nearly all of the symbols can appear super-sized, from the higher paying symbols to the lower value ones. 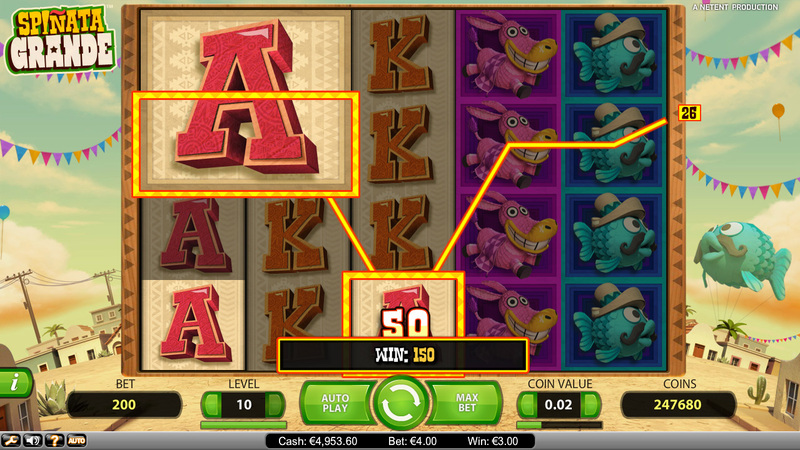 The other feature to talk about at this slot is the bonus game, which can lead to some really nice prizes. What’s more, it is quite simple to activate. This is because it is started simply by spinning any part of the giant slot machine symbol into view on the reels. 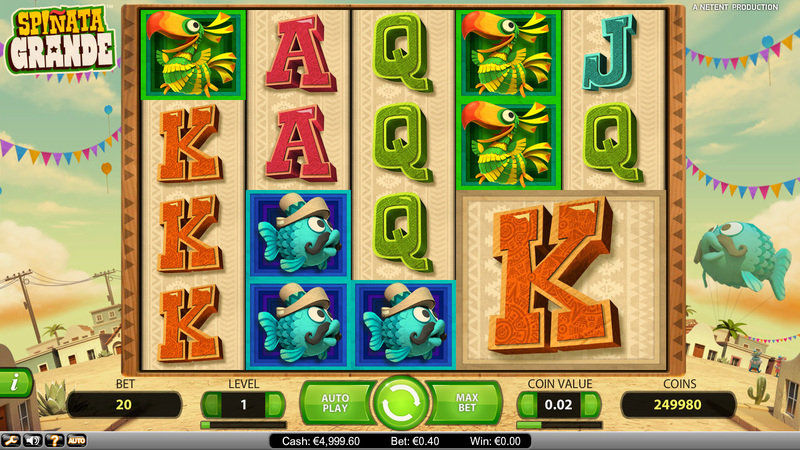 The reels will then spin and reward the player with more free spins, or cash prizes. What’s more, there’s a colossal wild symbol on the reels, and when it spins into view you can expect to win some seriously large prizes. That’s all there is when it comes to bonus features at Spiñata Grande. Sure, there might not be too many of them, but the ones that are there are incredibly good. The bonus round is a definite high point, however the real stars of this slot are the gigantic symbols that spin around on the reels during the base game, as they cause the base game of this slot to be one of the most exciting found anywhere online. 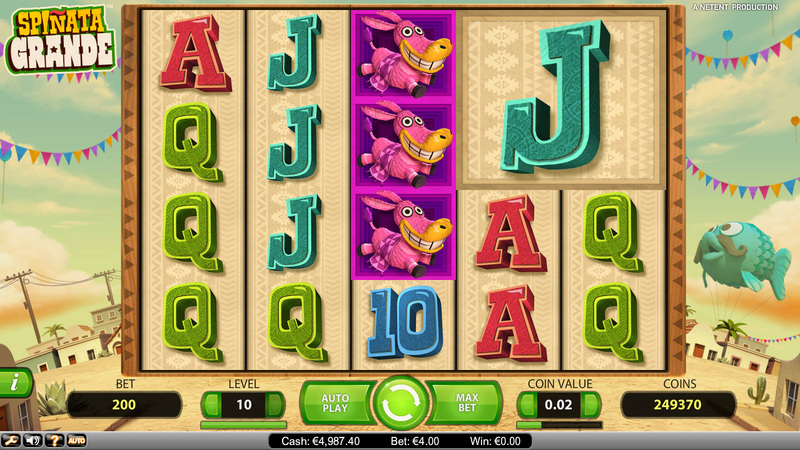 Why not see how exciting this slot is by having a few spins today at your favorite online casino?